We’d love your help. Let us know what’s wrong with this preview of Into the Mist by Steve Finegan. To ask other readers questions about Into the Mist, please sign up. Main Character Gabe, has epilepsy from a childhood injury. His brother Sam, was pushing him on a swing and gave him too hard of a push which sent him flying into a brick foundation. He had just moved into a new house, is in a new state, and is starting a new school. No easy feat for a teen that believes he's a freak. Ever since his accident his mother has been overly protective of him. Sam is jealous of the attention that is paid to Gabe and likes to bully him. Gabe's dad is there for him and tr Main Character Gabe, has epilepsy from a childhood injury. His brother Sam, was pushing him on a swing and gave him too hard of a push which sent him flying into a brick foundation. He had just moved into a new house, is in a new state, and is starting a new school. No easy feat for a teen that believes he's a freak. Ever since his accident his mother has been overly protective of him. Sam is jealous of the attention that is paid to Gabe and likes to bully him. Gabe's dad is there for him and trying to get his wife to lighten up a little bit and give Gabe the freedom he needs to grow and be a normal guy. Gabe meets his neighbor Ellie, when he is sitting outside drawing one of his comics in his backyard and she comes up and wants to see what he is doing. She is interested and appreciative of Gabe's talent. Ellie tells him the story of the woods cursed behind their house by the Brynmor Witch. While in the woods Gabe has an "auora" and when he finally shares what happened with Ellie she is of the belief that her and Gabe are some how connected to the Witch. Gabe also has to deal with all of his new classmates which suddenly seem to take an interest in him. Is it a good thing or a bad thing? This is a very interesting and well written book that will keep your attention to the end. The initial chapters start creating the ambient and the plot warm up in direction to the intense final moments of this first of two fantasy books narrating the saga of our heroes. The plot is simple to follow. The family of a young boy (Gabe) with Temporal Lobe Epilepsy moves to a new city, where the boy has to adapt himself to his neighborhood and his new school. He befriends with a girl next door (Ellie) This is a very interesting and well written book that will keep your attention to the end. The initial chapters start creating the ambient and the plot warm up in direction to the intense final moments of this first of two fantasy books narrating the saga of our heroes. The plot is simple to follow. The family of a young boy (Gabe) with Temporal Lobe Epilepsy moves to a new city, where the boy has to adapt himself to his neighborhood and his new school. He befriends with a girl next door (Ellie) and together they start living adventures in the woods behind his property, where it used to live a woman that was considered to be a witch. And things develop from there and during his epileptic crises, he is transported to an alternate world, rich in mythological creatures, where he has the role of a hero. The description of the alternate world is superb and you will get involved easily with the new set of characters. Although the story starts slowly, it goes on a "crescendo" till it reaches its climax at the end. It is a very entertaining book, very well written. Really enjoyable. I recommend this book to the permanent library of all readers that love young adult novels with a good plot, with mystery, suspense, friendship, basically all good ingredients to a great fantasy book. This book was written by Steve Finegan and it was published in January 2012. The author was kind enough to provide me an electronic copy for reviewing in .mobi format. I was not required to provide a positive review. Opinions expressed here are my own. A delightful, captivating, and fascinating “urban” fantasy, this is the beginning of a series, and what a delight that is. I truly loved this book and could not set it aside. Author Steve Finegan not only knows his Celtic lore, he knows characterization, inside and out. I’m not generally a fan of fantasy, especially high or epic fantasy, but this book is just special, and I highly recommend it. Seventh-grader Gabe just moved into a new house, new locale, and dreads trying to meet new kids and st A delightful, captivating, and fascinating “urban” fantasy, this is the beginning of a series, and what a delight that is. I truly loved this book and could not set it aside. Author Steve Finegan not only knows his Celtic lore, he knows characterization, inside and out. I’m not generally a fan of fantasy, especially high or epic fantasy, but this book is just special, and I highly recommend it. Seventh-grader Gabe just moved into a new house, new locale, and dreads trying to meet new kids and start in a new school. Gabe’s anxiety is not only the routine worries of “new kid on the block”: he suffers from temporal lobe epilepsy, and although it is a mild case and doesn’t require medication, still he has “auras”: olfactory and auditory “hallucinations.” Poor Gabe is henpecked by an overprotective mother, the target of his brother’s jealous rage, and mocked by potential friends and schoolmates for his surpassing creativity. Yet even the “ugliest curse” can turn to silver, as Gabe unexpectedly discovers he is actually a long-awaited Celtic hero, the only one who may be able to turn back the undead forces of Arawn, Lord of Death and the underground. It took some adjusting to get used to this authors style of writing and the concept of the world he created. The concept of the story was actually really interesting and once you started learning about the boundaries and ideas of the world it became easier and more acceptable to understand. Though at times I found myself confused on what was happening I was able to eventually grasp the idea and move forward. It was in the end a fun and fast read and with a little improvement it could become something even more. The plot was really tricky; there was a ton of sub-plots and conflict all within this story. I felt at times a little overwhelmed on whether I was in one world or the other. But there were definitely some really cool concepts being formed, the world that was building was becoming something in itself…the author was definitely clever when it came to creating a story filled with so many elements and surprises and even when I found it to be disorienting at times I also found myself impressed with the idea itself. So overall the plot wasn’t fully built on a great foundation and lacked greatly in some areas on directing the reader throughout the story it did have a fascinating storyline and followed along each plot point. There were some characters that lacked the “touch”. Though they had potential to be a great asset to the story they lacked an important element. They also weren’t necessarily flat characters, they did have some life to them it was just like they were a painting and they lacked a certain color. But not all of the characters were that way, Gabe and Ellie were in fact created with some interesting qualities. And though I found Gabe a very weak character in the beginning I also found him to be a bit different as the story progressed. But in all though the characters weren’t necessarily the winning element to me in this story they did bring some interesting texture to the story. Gabe transformed the most in this book and I really enjoyed that it wasn’t at all rushed and unbelievable. We were right alongside him as the secrets and ideas were at last uncovered. And with those secrets and ideas coming to the surface Gabe all but had a choice to transform alongside them. As for the other characters there were some smaller and more discreet transformations, I really enjoyed that not all of them changed in this book, it leaves even more room for the characters to grow in the next book to come. And of course there were the characters that didn’t change at all but in my opinion they needed to stay the same, it made the world more real and believable, not everyone’s going to change, sometimes it takes more of destruction to change a person, in all I was pleased with this element of the story. The description was pretty good throughout the story, at times it was really great, I was really able to picture it, I could just imagine being there, smelling the odors, hearing the sounds, and feeling the overall environment of their world. There were a few places that had a little too much description, it almost overwhelmed me to the point I was tempted to skip over it and move on but in the end that part was a very important part of the story and I can see the need for description. Though I wouldn’t call the description poetic I do think it had a nice smooth flow to it at times, the scenes were really well defined created. I found the style to be interesting and unique, though I feel this ties closely to what I described about the plot, I did find the style to be hard to adjust to. The flip flopping between the two worlds had rough edges and at times was confusing. But I did enjoy the POV’s I was able to see through, the two minds were so alike but in a way vastly different. This was definitely a one of a kind book. “But it was too late. Whatever had been damned up inside Gabe for so long was coming up and out, and it was not the angry outburst he'd expected. He didn't know what it was. It was if someone else was speaking, haltingly, and from a remote corner of his aching heart, a truth that he knew only as he heard it spoken." Thirteen-year-old Gabe Wrenn is unsettled by his family’s move to the creepy old house on Byrnmor Street. Even more unsettling is the prospect of being the new kid in school on Monday, and the object of everyone’s gawking stares, when all he wants is to be left alone with his sketchpad. It’s an epileptic hallucination for sure, and another sign that his bullying older brother Sam is right: Gabe’s nothing but a brain-damaged freak. This opinion is not shared by Ellie Yvonne, the impetuous girl next door. With disturbing conviction, Ellie declares that Gabe’s epilepsy makes him special. It could even be the key to unlocking the secret of the Brynmor Witch’s bramble-choked grave at the heart of The Woods. I would recommend this book to sci-fi and fantasy fans. This has the elements to make a great fantasy and I think with a little editing it could become a much more rounded and fun read. I wouldn’t recommend this to anyone who is a light reader; it takes some effort to get into so if you’re one of the readers who reads just to relax this might not be the book for you. In all the ending left me wanting to continue reading this book, it definitely left you questioning on what’s to become of this world. In the end I enjoyed reading this book and it didn’t take me too long to read, this author has some great potential on creating a fun and great fantasy if only a little more practice. Disclaimer: I received a free, advance copy of this book through Book Rooster. I am not receiving compensation of any kind for this review. Into the Mist: Silver Hand is a YA novel that also resonates for adults. Well written, insightful and intriguing, it twines the strands of two stories into one, fusing the protagonist’s dual experiences in both the concrete world of reality and the evanescent world of myth. Gabe Wrenn is a seventh grader diagnosed with TLE or Temporal Lobe Epilepsy. His overpr Disclaimer: I received a free, advance copy of this book through Book Rooster. I am not receiving compensation of any kind for this review. Gabe Wrenn is a seventh grader diagnosed with TLE or Temporal Lobe Epilepsy. His overprotective, helicopter mother, hovers every minute, watching everything he does for signs and symptoms of progression of his disease. His older brother bullies him remorselessly and his father tries to protect him without coming into direct conflict with Gabe’s mother. When the family moves to a creepy, old house in a new town far from home, Gabe tries to find solace in his art, for which he has a talent so great, his father feels awed and his mother suspicious. Gabe has created a graphic novel featuring Lord Corvus, a hero based on a Welsh myth, whose name means Crow. The story has always been his imaginary retreat, but after the move to the new neighborhood, it becomes ever more real and compelling to the young boy. Gabe begins experiencing dreamlike states when he feels as if he is actually in another place. He fears that these episodes are really seizures brought on by the TLE. The day of the move, Gabe meets Ellie, an idealistic tomboy who believes she feels the presence of the local witch in the woods adjoining the park in the town. Together they try to uncover the mystery of the woods and Gabe’s experiences with the other world, while they also deal with the trials and tribulations a middle school student must endure when he enters a new school and has to establish his place in the local hierarchy. Ellie proves to be a staunch ally as Gabe reels from the multiple stressors and alternately believes and doubts the reality of his experiences. As events in both worlds steadily escalate, Gabe slowly changes. I really enjoyed this book and would definitely recommend it to young adults as well as not-so-young adults, especially anyone who likes paranormal fiction. It captures the sweet innocence of young friends on the verge of romance, the covert dysfunction of a family dealing with illness and unresolved emotions, the feral pack mentality of the middle school clique and the baroque mystery of Welsh Mythology. Since I was not familiar with Welsh Mythology, I researched some of the terms and characters featured in this novel and was pleasantly surprised to find the book closely followed the myths it referenced. The author definitely did his homework with the myths and so cleverly interwove his imaginary elements with the mythos that it was impossible to tell his creation from the Welsh Mythology, until it was researched. Even after that, I was not completely sure. This is the first book in a series, the second of which is scheduled for publication in 2013. I wish it were available now. I would definitely buy the entire series and read it right away. The book ended rather abruptly, just at the height of the conflict in both worlds. Although this seems to be the trend with series’ recently, I personally would prefer to have a novel resolve at least some of the conflicts and tie up some of the loose ends. I think this could have been accomplished without losing the impetus of the story and I still would have wanted to read the rest of the series. Overall, I found this book engaging and entertaining. Well done, Mr. Finegan! Into the Mist: Silver Hand is a brilliant novel that brings back a lot of memories for me. It reminds me of reading fantasy novels when I was young and the excitement and thrills that I get when turning through the pages. The book is basically two stories in one and Finegan does a marvellous job balancing and blending a modern day coming of age story with a traditional fantasy story set to a Celtic background. 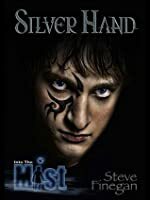 The story is about Gabe, a 13 year old boy who is suffering from mild Temporal Lobe Epi Into the Mist: Silver Hand is a brilliant novel that brings back a lot of memories for me. It reminds me of reading fantasy novels when I was young and the excitement and thrills that I get when turning through the pages. The book is basically two stories in one and Finegan does a marvellous job balancing and blending a modern day coming of age story with a traditional fantasy story set to a Celtic background. The story is about Gabe, a 13 year old boy who is suffering from mild Temporal Lobe Epilepsy. His mother overprotects him because of this and as a result he doesn't get to do things boy of his age do and branded as a freak by some. Despite his condition, one thing that Gabe does well is his drawings of a heroic figure he calls Corvus. This talent is quickly spotted by Ellie, the girl next door at his new home. Through their adventures together they discover that Gabe's epilepsy is not as simple as it seems. In fact when Gabe has his seizures or auras as his mum would call it, he would appear in an ancient wood as the Celtic legend Mabon. Ellie believes that Gabe is somehow linked to this Mabon and Gabe must do everything he can to save Mabon's world. As I said before this novel is two stories blended together. In the modern world Gabe has to deal with alienation and embarrassment because of his condition. Through his actions as Mabon, Gabe gains the strength to face his fears and to stand up to the bullies which ends in an intense and dramatic confrontation. At the same time, Mabon's world, Elfyth is facing an invasion from the Grayman and his undead army. Gabe has to juggle between being himself, as well as Mabon as he faces challenges in both worlds. Just as Rick Riordan has brought a new perspective to ADHD and dyslexia in his Olympians series, Finegan has turned TLE into something that is a gift in this book. Some of the world's most creative mind suffered from epilepsy and some argues that it was epilepsy that gave them the extra insight and flair in their works. In the book, Gabe went from being afraid to finally accepting it as part of who he is and he can't rely on drugs to make him feel better. While staying true to Celtic mythology, the author does a pretty good job bringing it to live. However in this first book we are only getting glimpses of Elfyth but I'm sure we will see more of this world in the next book when Mabon faces the Grayman and his army. Just as the book reaches its climax, the story ends. I don't dislike cliffhanger endings and I understand why it ended like it did but I still prefer if it didn't finish with so many loose ends. I got "Into the Mist: Silver Hand" by Steve Finegan from a member giveaway. "Into the Mist: Silver Hand" is about Gabe Wren a thirteen year old boy who loves to sketch and and draw. Gabe is an excellent artist with a lot of imagination. His favorite character to draw is "Corvus" a crow man. At the beginning of the book, Gabe has just moved to new town and is starting a new school. As if dealing with these things was hard enough, Gabe also has a secret. Gabe has a form of epilepsy called TLE. Whi I got "Into the Mist: Silver Hand" by Steve Finegan from a member giveaway. "Into the Mist: Silver Hand" is about Gabe Wren a thirteen year old boy who loves to sketch and and draw. Gabe is an excellent artist with a lot of imagination. His favorite character to draw is "Corvus" a crow man. At the beginning of the book, Gabe has just moved to new town and is starting a new school. As if dealing with these things was hard enough, Gabe also has a secret. Gabe has a form of epilepsy called TLE. Which was caused by a head injury he received in an accident when he was six years old. Because of his epilepsy he sometimes has auras, where he sees, smells and hears things that are not there. Sometimes his TLE makes him lose his temper and he lashes out at people. When he was at his old school, Gabe got upset in front of his classmates and stated knocking things off the table. Gabe's older brother Sam calls him a "freak" and a "nut-job" because of the way Gabe acts when he has an aura or a mild seizure. To make matters worse, Gabe's mother is extremely overprotective to the point of treating him like a baby. Because of these difficulties, Gabe has never had a friend. Until he meets his new next store neighbor Ellie Yvonne. When Ellie sees his drawings and finds out that Gabe has epilepsy, she is convinced that Gabe is someone special, someone bound for destiny. After making friends with Ellie during a trip to the Brynmor Woods strange things start happening to Gabe. His aura's intensify. Not only does Gabe draw Corvus, he draws the warrior Mabon, The sorcerer Merlyn. The Grayman and Arawn. The Grayman and Arwan are battling King Bran and Merlyn for control of Elfyth. Merlyn believes the young warrior Mabon is Elfyth's only hope to survive. To Gabe, the world in his drawings is real. Gabe feels as if he becomes the character Mabon when he has his aura's. This book can truly be two stories in one. The story of Gabe in his world and the story of Mabon in Elfyth. During the course of the book, Gabe has many challenges in both the his "real" world and in the world of "Elyfth." He has to battle bullies at school in his "real" world. He has an an oath with Ellie to protect the Brymor Woods from being cut down because of a rec center being built. If the Brymor woods gets destroyed, Gabe and Ellie fear the Elfyth could be be destroyed also. This book is undoubtedly awesome, a skilful rendering of a tale both real and fantasy that matches, and in many cases, surpasses anything a trade publisher might put out. If you still need convincing about the quality of Indie books, then read this. I totally recommend it and if you have a teenage son, then get it immediately. The thing I really liked about this book, apart from the quality of the writing, the skilful pacing, the excellent characters, dialogue and everything else, was the combination of fantasy and reality and the relationship between the two worlds. Without this cross over, the fantasy elements would have been just another high fantasy, but the real world events were much more interesting. Finegan took very ordinary situations and made them extraordinary. Gabe Wrenn is an epileptic and bullied because of it. He hasn’t had a major seizure, just partial ones that he calls auras, so he isn’t on medication – yet – and he and his father don’t want him on it, whereas his overprotective mother isn’t so sure. He shifts house and finds himself living near the sacred mound of the Brynmor Witch, which the locals say is cursed. Gabe has a fantastic imagination and is drawing a graphic fantasy novel, something he is very good at. But after the shift he finds himself falling into the world of his drawings and doesn’t know if it’s the epilepsy or something to do with the presence he feels when near the grave of the Brynmor Witch. Luckily, he isn’t entirely alone in this weirdness because he meets a girl who doesn’t think he’s crazy and who figures that what happens in the ‘fantasy’ world affects what happens in the real world. The bullying in the book becomes extreme and builds up to a dramatic climax matched in intensity by the happening in the other world. The last third of the book is gripping and intense and the ending is abrupt. I didn’t like the ending because it leaves the reader in a pretty dismal place and I didn’t understand why the fantasy version of Gabe did what he did. He made an enormous decision that was a complete turn around from his stance of just a few moments prior. It seemed out of character and without sufficient motivation. However, it wasn’t enough to mar the book for me, and I give it an easy 5 stars. I wasn’t sure what I would make of Steve Finnegan’s Into the Mist as I started reading. I enjoy fantasy though I’m getting a little jaded by books trying to hook me into series. I’m fascinated by how the mind works, but I’m not sure how well sympathy and illness lead to plausible characters. And I love ancient mythology but sometimes feel dismayed at how modern stories tend to use it instead of reinterpreting it. That said, I actually enjoyed this book a lot and was sorry to read the final page. I wasn’t sure what I would make of Steve Finnegan’s Into the Mist as I started reading. I enjoy fantasy though I’m getting a little jaded by books trying to hook me into series. I’m fascinated by how the mind works, but I’m not sure how well sympathy and illness lead to plausible characters. And I love ancient mythology but sometimes feel dismayed at how modern stories tend to use it instead of reinterpreting it. That said, I actually enjoyed this book a lot and was sorry to read the final page. Please, please… I want some more. The story doesn’t finish, which ought to annoy me. But it does have a reasonable sense of completeness and doesn’t cheat the reader. Gabe’s Temporal Lobe Epilepsy really does become integral to the story. And the mythology delights, with just enough hints of the familiar to heighten a powerful sense of mystery. The real-world parts of this story bring Gabe to a new home, school and town. The background to his illness is left to be discovered as the story continues rather than forced down the reader’s throat, and his parents’ and brother’s different responses to his TLE are pleasingly plausible, with just enough space for change. School is a challenge, especially when the bullies attack Gabe’s difference, and there are some truly scary, sadly believable scenes. I really admire the author’s ability to create realistic atmosphere and threat without using offensive words, though very occasional minor slips frustrated me. Meanwhile another world lies just beyond the edge of mystery. There’s a nice interplay between duty and trust, following your calling and doing as you must. The modern world ignores the past and nature at its peril, and Into the Mist feeds that peril very nicely into a closely tied fantasy world. Witches, sacrifice, swords and sorcery combine with nice humor, great dialog, wonderful characters and real-world problems to create a novel that, despite its length, comes too quickly to its end. Uneven in places, but quickly absorbing, well-imagined and well-told, I really enjoyed this tale. Epileptic seizures frequently are preceded by "Auras", a sense of disorientation, déjà vu, even altered sense of taste, the world just seems different. What if the Aura was evidence of something different? What if it is magic welling up? Gabe suffered a head injury when he was six. Since then, the sensations he experiences have been diagnosed as epileptic auras. His mother is overprotective from a sense of guilt. His father turned away from his creative accomplishments in order to support his fam Epileptic seizures frequently are preceded by "Auras", a sense of disorientation, déjà vu, even altered sense of taste, the world just seems different. What if the Aura was evidence of something different? What if it is magic welling up? Gabe suffered a head injury when he was six. Since then, the sensations he experiences have been diagnosed as epileptic auras. His mother is overprotective from a sense of guilt. His father turned away from his creative accomplishments in order to support his family. They move with Gabe and his older brother in support of Dad's career to a small town in the Northwest. Just up the street is an empty lot, shunned by the town, where a witch died. He is introduced to the dead witch's home site by a new friend. As he finds himself drawn to the site, he discovers that his new friend senses the witch. At the same time, his auras come more frequently and intensely and he begins to fall into trances where he lives the life of Mabon, the son of a goddess in a parallel world and the potential savior of that world. Meanwhile he's trying to cope with the consequences of an overprotective mother and a bully older brother. He only has one friend in a new town and everyone thinks he's a wimp. He knows he needs to save the world of Mabon, but this world keeps pulling him back. Will he be able to save it and will he be able to come back home? The author does a great job capturing the life of a teenage boy suffering with numerous problems, but with the heart of a hero. Gabe is the center of the story, but the rest of the characters have real dimensions and are believable. A new exciting young adult fantasy series recently hit bookshelves in the novel INTO THE MIST: SILVER HAND by Steve Finegan. Just as most thirteen year olds Gabe Wrenn seeks solace from bullies in his imagination. The outcome is a talent for drawing and storytelling that results in the creation of a graphic novel, a novel he shares with no one, until he meets Ellie. Then suddenly his whole world opens up. But with added popularity comes even harsher bullying. You want to know how Gabe navigates A new exciting young adult fantasy series recently hit bookshelves in the novel INTO THE MIST: SILVER HAND by Steve Finegan. Just as most thirteen year olds Gabe Wrenn seeks solace from bullies in his imagination. The outcome is a talent for drawing and storytelling that results in the creation of a graphic novel, a novel he shares with no one, until he meets Ellie. Then suddenly his whole world opens up. But with added popularity comes even harsher bullying. You want to know how Gabe navigates the move to a new home, a new school while dealing with an over protective mother and a new doctor. Gabe has epilepsy and the way Steve Finegan explores this aspect of the novel is one of the most interesting parts of the story, although he leaves us wondering if Gabe is traveling between two worlds or if his epilepsy is feeding his fantasy. This book is the kind of story all ages will enjoy. How can you resist the Brynmor Witch, Lord Corvus or Raven Women? However, I must insert a caveat -- the book finished way before I was ready for it to finish. In my mind the solution to the story’s first problem, the cutting down of the trees in The Woods of Brynmor Park, should have been solved before the next problem arose. In other words there is a jaw dropping cliffhanger. This is a book I would highly recommend and a series I look forward to reading more off. INTO THE MIST: SILVER HAND introduces us to Gabe Wrenn, and the inspired world he has created for his graphic novel. This was a thrilling read. I can't wait for Steve Finegan's next installment, promised for 2012 BRINGER OF THE DAWN! *I was given an advanced copy of this book by the author for review, but my rating was not influenced by it. The premise of the book is interesting and somewhat novel in that our protagonist is a teenager with epilepsy. When it comes to YA fantasy the plots are beginning to look pretty similar, bending with popular trends, so it was nice to see Finegan trying something new. The basic plot is that Gabe, a teen boy who experiences seizures and feels like an outcast, moves to a new town with his fam *I was given an advanced copy of this book by the author for review, but my rating was not influenced by it. The basic plot is that Gabe, a teen boy who experiences seizures and feels like an outcast, moves to a new town with his family and befriends the girl next door. The girl believes that Gabe’s epilepsy is actually some sort of gateway to another world which sets them on adventures in both this new world and their own. While I appreciated some of the unique twists I did feel that Finegan fell into the same teenage plot trap that so many authors succumb to. The whole thing felt a bit like a teenage boy’s fantasy. The plot screams “I’m not weird, I’m special!” and the author sometimes gets bogged down in duel plots and narrative tone. A rivetting read that bodes well for the series. Gage, a young boy with a form of epilepsy, moves to a new town with his family where he meets his new neighbour Ellie, who seems to be guided by the spirit of the Brynmoor Witch, a woman who lived in the area in years past. The Brynmoor Witch had a cottage in the woods, an area local townspeople generally won't go near (the exceptions being Ellie and local bully boy/ badboy Alex). Ellie seems to recognise that Gage is different and when she takes hi A rivetting read that bodes well for the series. The Brynmoor Witch had a cottage in the woods, an area local townspeople generally won't go near (the exceptions being Ellie and local bully boy/ badboy Alex). Ellie seems to recognise that Gage is different and when she takes him up to the woods an epileptic episode seems to take him to another place. Throughout the rest of the story we are transported between the two worlds, both perilous in their own way. In this world Gage has to cope with his medical condition, his family and starting a new school, complete with bullies. In the other world, Elfryth, Gage takes on the persona of Mabon Silverhand, a character from Welsh Myth, who is all that stands in the way of Arawn and his allies taking over the land. In Elfryth we meet several characters from the myths (Merlyn, King Bran etc)and also Corvus, the crowman who Gage has been drawing as a comic book in his sketchpad. The stories of Gage and Mabon are both intertwined and both told well. You get a slightly different style and tone of storytelling for each character which I found to be very effective. The story builds to a climax that ends with a cliffhanger that left me stunned and aching to get my hands on the next book in the series. Gabe is a young teen under pressure. He has just moved to a new town, facing a new house, a new school, and all the trouble that comes with it. In addition to his regular stresses, he lives with an epilepsy disorder resulting from a head injury when he was little. Strangely, his affliction initiates a connection to something fantastic. After meeting the perky neighbor girl, Ellie, supernatural things begin to happen to Gabe. A strange wood full of old trees, a ruin, a witch's ghost, and a creepy Gabe is a young teen under pressure. He has just moved to a new town, facing a new house, a new school, and all the trouble that comes with it. In addition to his regular stresses, he lives with an epilepsy disorder resulting from a head injury when he was little. Strangely, his affliction initiates a connection to something fantastic. After meeting the perky neighbor girl, Ellie, supernatural things begin to happen to Gabe. A strange wood full of old trees, a ruin, a witch's ghost, and a creepy legend all lead into the Mist. Steve's story is packed with action, fantastic scenes, and heroics. Gabe's calling and unique challenges flavor this story with realism alongside the supernatural. All the awkwardness of life as an early teen, coupled with that knowledge that somehow he is different from everyone, inferior, makes Gabe a compelling character. The amazing things he has to do to overcome his fear and doubt to set things right make me want him to succeed. I did feel that sometimes the flow of the story was interrupted by excessive description. I sympathize with the author's love of his scenery and ceremony, but I think he would have achieved better flow if he had left it to the reader to imagine some of the setting. An enormously surprising book for me, Into the Mist takes place between this world and another where magic rules and there is an epic battle between good and evil. Why was it surprising? Because the premise of the book, while promising, revolves around a thirteen-year-old boy. And I didn't think that a book that has a young boy as its hero would be as profound as this. From the beginning I was completely wrapped up in the story of Gabe and his new friend Ellie. Gabe, who has a hard time making fr An enormously surprising book for me, Into the Mist takes place between this world and another where magic rules and there is an epic battle between good and evil. Why was it surprising? Because the premise of the book, while promising, revolves around a thirteen-year-old boy. And I didn't think that a book that has a young boy as its hero would be as profound as this. From the beginning I was completely wrapped up in the story of Gabe and his new friend Ellie. Gabe, who has a hard time making friends due to a battle with epilepsy, immediately connects to his next-door-neighbor, Ellie, who has a secret to share. And, as if is medical condition wasn't enough, Gabe has a mother who hounds him and doesn't understand him, a brother who, seemingly, hates him, and isn't very popular at his new school. And, finally, Ellie introduces him to a whole new mysterious world that opens up the door to another side of who Gabe is. Anyone who loves fantasy stories, and against-all-odds circumstances will undoubtedly enjoy this read. In my opinion, Steve Finegan is a brilliant writer, with a brilliant story to tell. Very entertaining read with a killer cliff-hanger that will ensure you read the sequel when it comes out. This book deals with the stigma of being different (in this case having epilepsy) and how it impacts not only the person with the stigma but all those around them. The impact on each familial relationship is different, and all for different reasons. And since the protagonist is the one who has TLE (the type of epilepsy he was diagnosed with) we get to see how heavily it impacts him. But everyt Very entertaining read with a killer cliff-hanger that will ensure you read the sequel when it comes out. But everything begins to change when his family up and moves to a new town, new state, and worst of all, a new school. Gabe dreads starting at a new school, but actually makes a friend on his very first day - almost as if they were fated to meet. And when Ellie shares The Woods with Gabe, she starts something beyond all imagining and far beyond their control. Is it all just a figment of the auras the Gabe's epilepsy causes, or could it actually be real? I was sent a copy of this ebook as an ARC, and really appreciated the chance to get to read it. Steve Finegan paints amazing word-pictures, and I was quickly drawn deep into the book. Into the Mist: Silver Hand reminded me a lot of The Dark is Rising by Susan Cooper and Shamran by Bjarne Reuter in its atmosphere and structure. Since ItM:SH is the first book in a series, it very much served to set the stage for the coming books, and as such I preferred the 'OtherWorld' aspects of the story to thos I was sent a copy of this ebook as an ARC, and really appreciated the chance to get to read it. Steve Finegan paints amazing word-pictures, and I was quickly drawn deep into the book. Into the Mist: Silver Hand reminded me a lot of The Dark is Rising by Susan Cooper and Shamran by Bjarne Reuter in its atmosphere and structure. Since ItM:SH is the first book in a series, it very much served to set the stage for the coming books, and as such I preferred the 'OtherWorld' aspects of the story to those in 'ThisWorld'. I really, really liked Ellie, and wanted to shake Gabe for being so enamoured by Rachel as to forget about her from time to time. I know that the dark powers of 'ThisWorld' has something to do with that, and am intrigued to see whether this will be explained further in the next book in the series. INTO THE MIST : SILVER HAND WAS A GREAT STORY. THIS IS THE REASON I GAVE A 4 STAR RATE. AS I READ ABOUT 53% OF THE BOOK I REALIZED I JUST COULDNT GET INTO IT. I TOUGHED IT OUT AND READ THE WHOLE THING. IT IS A STORY ABOUT A BOY NAMED GABE WHO HAS A FORM OF EPILEPSY AND FINDS HIMSELF IN ANOTHER WORLD WHEN HE HAS AN "AURA". HE IS A FREAK IN THE REAL WORLD BUT IN HIS FANTASY WORLD HE IS MABON, A GREAT HUNTER AND SON THE GODDESS MADRON. WHEN GABE IS "MABON" HE IS THE ONE WHO WILL SAVE ELFYTH FROM TH INTO THE MIST : SILVER HAND WAS A GREAT STORY. THIS IS THE REASON I GAVE A 4 STAR RATE. AS I READ ABOUT 53% OF THE BOOK I REALIZED I JUST COULDNT GET INTO IT. I TOUGHED IT OUT AND READ THE WHOLE THING. IT IS A STORY ABOUT A BOY NAMED GABE WHO HAS A FORM OF EPILEPSY AND FINDS HIMSELF IN ANOTHER WORLD WHEN HE HAS AN "AURA". HE IS A FREAK IN THE REAL WORLD BUT IN HIS FANTASY WORLD HE IS MABON, A GREAT HUNTER AND SON THE GODDESS MADRON. WHEN GABE IS "MABON" HE IS THE ONE WHO WILL SAVE ELFYTH FROM THE GRAYMAN. BTW HE IS A REALLY NASTY CREATURE. BOTH WORLDS WERE DESCRIBED PERFECTLY. SOMETIMES I COULD EVEN SMELL THE APPLE BLOSSOMS. I ALSO APPRECIATED THE CHRISTIAN OVERTONES IN THE BOOK. THE AUTHOR SKILLFULLY WROTE THIS BOOK. THE CHARACTERS WERE VERY WELL DEVELOPED AND BELIEVABLE. IF YOU LOVE FANTASY NOVELS THAT KIND OF REMIND YOU OF LORD OF THE RINGS TYPE STUFF THIS IS A MUST READ. I really liked this. It was kinda hard to get into in the beginning. What I liked best was getting to learn about a new type of mythology. Gabe was surprisingly a very strong main character. I loved all the art and the epilepsy was kinda fascinating. Ellie was so cute. I love how she never gave up on what she believed. Gabe should listen to her more often. I hope they get together in the next book they would be a super cute couple. The plot was pretty fast paced. There was tons of twists. I never guessed what was gonna happen. It was a little confusing at times. Mainly the Mabon parts. Overall I really liked this. I love reading new stuff. Im very excited for the sequel. I recommend if you enjoy mythology. Wow! Talk about a cliffhanger! I need more! Silver Hand is such a unique and fun book combining ancient legends with urban life. The plot is complex and creative and the characters so vibrant and alive. They could live just down the street from me! The writing creates such a vivid world for this exciting story! I can't wait for the next book! This is a definite must-read for anyone who enjoys urban fantasy! Gabe Wrenn is a young boy with epilepsy, who moves to a new house in a new town. His brother treats him like a freak, his mother babies him. All he has is his art. When he meets Ellie, the girl next door, he is drawn into an adventure that brings his art to life. I loved this book, the story moved seamlessly between worlds. I can't wait to read more! I thoroughly enjoyed reading this book. The plot was excellent and well developed. I was disappointed when I came to the last page, I wanted more. The characters were easy to identify with and follow. I highly recommend this book. Really liked this books concept. Full review to come. I am a seeker of the extraordinary in the ordinary and an avid, eclectic, voracious reader. My blog, ACHIEVING WOW!, is now home to a growing collection of 100-word stories & wonders (drabbles). I am author of the YA novel INTO THE MIST: SILVER HAND, an urban fantasy about a "special" boy whose disability is a gift he must use to defeat a dark power. I am also growing a short story collection I am a seeker of the extraordinary in the ordinary and an avid, eclectic, voracious reader. I am also growing a short story collection entitled THE ALAMEDA. These stories, which feature a young cast of characters from the same neighborhood, are set in Portland, Oregon during the magical, tumultuous 1960s.